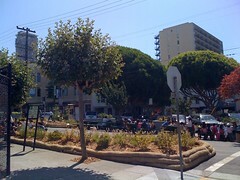 The neighborhood of North Beach has created a garden, from Columbus Ave to Lombard St. It’s cool. The few times I’ve walked by there’s been folks enjoying it. A woman reading a book, a guy eating his lunch, school kids sitting and eating. I heard that this was a “put it in, see if it works” experiment, between the library and the parking lot (“the triangle”) that is under development. City officials were involved, and as you can see there are new trees, greenery, stumps for sitting, etc. The posted rules include an ominous “no food preparation that involves a health department permit” and oddly “no amplified music” but otherwise it’s a true neighborhood, scrappy endeavor. I for one thought that right turn from Columbus, onto Mason, was one of the most dangerous corners in the city. I’ve seen a pedestrian get clipped, and always thought it was a matter of time before something really bad happened. It’s downhill for cars, after the traffic jam of downtown North Beach, so they’re racing through it. For pedestrians, it’s an uphill slog that takes a while, and the library entrance is within a few feet meaning there’s kids streaming out of there all times of day.